Want to know more about tapping maple trees? If you want to have fresh maple syrup all the time, then this is something you should learn. It’s also a fun and unique skill that I think every homesteader should add to their arsenal! Nature provides a bounty of delicious foods for humanity to enjoy, and few rival the rich sweet goodness of genuine maple syrup. It makes a wonderful alternative to processed sweeteners, with the ability to lend its distinctive flavor to everything from baked goods to drinks. And of course, nothing beats real maple syrup on top of a stack of homemade pancakes. One unique quality of making maple syrup is that it can be done on any scale. Some operations tap thousands of trees in a season, others tap just fifty. You can tap just a single tree if you want to. No matter how tiny your project, your end result is likely the same amazing quality as that of professionals. If you are blessed with access to maple trees, you can be successful making syrup even if you have no prior experience. You need only a few tools, and can start out with minimal expensive supplies. Follow these simple steps to create your own all-natural maple syrup that will melt in your mouth. These directions are intended strictly for a very small venture in maple syruping. My way is a good place to start for your first trial run at producing a few quarts of maple syrup for your own use. First, a little science lesson. The phenomenon known as “sap running” happens when nights are cool and days are warm, causing an ebb and flow in the pressure of the liquid inside the tree. In the northern climates where most maple syrup is made, the sap runs best during the period from late winter to early spring. Where I live, maple syrup season usually starts in late February to early March, and lasts about a month. It is also important to know a little about the trees themselves. It is possible to tap nearly any kind of hardwood tree and boil it down into something resembling syrup. But the sap of other trees tastes different from the sap of maple trees. You might like it more, less, or not at all. There are more than one kind of maple tree in most areas, and the one best for tapping is the sugar maple, or Acer saccharum Marsh. Other names for this tree include “rock maple” and “hard maple”. Sap from the sugar maple is preferred not only for its taste, but for the sugar content. The higher the sugar content, the less sap is needed per unit of syrup. On average, it takes forty gallons of sap from a sugar maple to make one gallon of syrup. Other trees take fifty gallons or more. Remember that nature is not like a factory—it doesn’t crank out rows and rows of tomatoes in identical sizes and shapes, or puppies that all learn at exactly the same rate, or hurricanes that develop in precisely the pattern and strength of other storms. Likewise, working with trees often yields varying results. Some red maples can yield excellent results, and some sugar maples might disappoint. Now, to get started. For every tap—that is, every hole in the tree—you will need one spile, one hook, and one bucket. Spile – a skinny little funnel that is inserted into the tree to collect the sap. One end is rounded like the end of a cigar, and the other opens out like a pour spout. A hook attaches to the center of the spile. I still use the old-fashioned metal type. They can last for years, and there are still plenty of them on the market for replacements. Buckets – they come in metal and plastic options, with a variety of lid styles and materials. You can get by with using any container you can rig to hang on the hook, as long as it is food grade. Some people even recycle milk jugs for this purpose. Drill – it will be necessary to make the hole in the tree. Either a manual or cordless electric drill is fine. You will need a clean 7/16 inch bit, preferably one which is brand new and dedicated to tapping exclusively. Food grade plastic or metal containers of 5-10 gallon capacity – You will need this as a way to collect and transport your sap. Long-handled skimmer and ladle – to use for skimming off foam. Filter – We use a tall thick cone filter made expressly for maple syrup, but you can use layers of coffee filters or thick paper towels if you need to. Tapping Supplies Tip: We like to sanitize all of our sapping equipment at the beginning and end of each season, using a ratio of 2 tablespoons bleach to one gallon of tepid water. Amazon has a great starter kit. Check it out here. They should be at least eight inches across at shoulder height, but closer to twelve inches is better. It is possible to compromise the health of the tree if they are smaller than that, and will yield less sap. At around sixteen inches across, you can consider two holes in one tree. Drill a hole 2 and 1/2 inches deep. It is helpful to wrap masking tape around the bit to use as a template. The hole should slant upwards into the tree just slightly. Be sure to reverse the drill to remove shavings. THEN – Place the rounded end of the spile into the hole. Tap it in gently with the hammer. It needs to be secure enough not to fall out under the weight of the sap in the bucket, but still able to be pulled out at the end of tapping season. Hang the bucket and lid. The purpose of the lid is to keep out debris and precipitation. If you are missing a lid, you can always fold tin foil over the top. Wrap it tightly to avoid being blown off. You might be tempted to set up a lawn chair on the snow and watch your bucket fill up with sap. As exhilarating as that might be—seriously, I love that kind of thing!—it will get old quickly. Do indulge in a taste of sap. It’s delicious! You will need to go around to your trees once or twice a day to collect the sap from the buckets. You will need one or two large containers for this. Since there is usually snow and ice on the ground during tapping season, the best way is to haul it in on a sled. (Don’t forget to wear your snowshoes to make life easier). Use whatever way works—there’s no wrong answer, as long as you get it to where you are doing your boil without dumping it. The easiest way for me is carry along an empty bucket. I lift the full one off the first tree and replace it with the empty one. I dump the sap into the big container and continue to the next tree. The bucket from the previous tree is now empty, so I exchange it at the next tree and continue repeating until they are all collected. If you are tapping only a few trees, it may not be worth your while to boil everyday. You can store your sap for a few days if it is cool enough. We set outs in the woodshed for storage and monitor it carefully if the weather turns warm enough to spoil the sap. If you open your container and the sap is cloudy, throw it out. Hauling my maple syrup on a sled in the snow like a true homesteader. So you’ve collected your sap, but now you need a way of boiling it down. This is done by reducing the water content, or “evaporating”. Think of it the same way you would reduce food liquids in the kitchen, by cooking it in a wide shallow pan over high heat—boiling down sap is really the same principle. There are many options for sap evaporation, depending on the size of your operation and your budget as well as your ingenuity. These range from multi-thousand-dollar setups to jeri-rigged back lawn affairs built from recycled components. NOTE – It is not a good idea to boil sap indoors. Just think about where all that moisture goes. Boiling a large amount of sugared water is likely to make your walls and ceiling a sticky humid mess. If you are making only a few pints of syrup, you may be able to get away with the indoor processing. And many people “finish” the syrup inside, cooking down just the final stages in a pot on the stove. We used a propane turkey cooker for our first few years of making maple syrup. With its relatively small diameter surface—as opposed to the wide flat pans most people use for boiling sap—and its usage of propane instead of firewood, it isn’t a very efficient way to go. We probably end up spending almost as much making our own as we would to buy it, but the experience is rewarding and the practice is invaluable. Boil the sap until it reduces significantly and begins to foam. Use the skimmer to remove the foam as it develops. This stage is one of the few advantages of using a turkey fryer—the likelihood of boiling over the edges of the pan presents less of a danger with the taller vessel, and the ability to shut down the heat quickly is an added plus. We bring the sap indoors to finish. We filter it at this point. Be sure to wet the filter with water before you start. Heat the sap in a stock pot on the stove. You can go by feel and taste to tell when it’s done, but you are guaranteed to make a few mistakes. Some will be too thin, some too thick. The end result will be imperfect but probably fine. If you prefer better precision, you can use a thermometer and bring the syrup to 7 degrees above boiling. While your sap is finishing, get some jars ready. You can use specialty jars made and sold just for syrup, or canning jars, or recycled jars. Some folks even use metal coffee cans with plastic lids. Make sure your jars are clean, sanitized, and hot. I find it handy to store them in a pot of simmering water while I’m waiting to use them. Fill the hot jars with boiling syrup to within a quarter inch of the top, fasten the lids tightly, and lay them horizontal on the counter-top to seal. Some people process them in a canner. Others don’t worry about sealing it at all. If syrup does develop mold on top, it can usually be skimmed, reboiled, and put in fresh jars with good results. 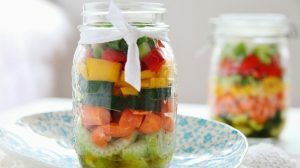 Once a jar has been unsealed, it’s a good idea to keep it in the refrigerator. In fact, if you have any qualms at all about storing your syrup safely, go ahead and keep it refrigerated or frozen to make absolutely sure. You will know when it is time to stop collecting sap when the trees begin to push buds. When that happens, the sap will take on a bitter taste and the season will be done. Don’t forget to pull your taps, clean them up, and put them away for next year. Amazingly, it is that easy: tap, collect, boil, and bottle. Maple syrup processing is easy to learn and is an excellent homesteading and prepping skill. The end result is an all-natural and renewable sweetener that tastes great and adapts to many different uses. Once you begin making your own maple syrup, you will be able to stock your own pantry and give it as gifts to special people in your life for years to come. What do you think about tapping maple trees? Have you done it before? How did it go? Let us know below in the comments!